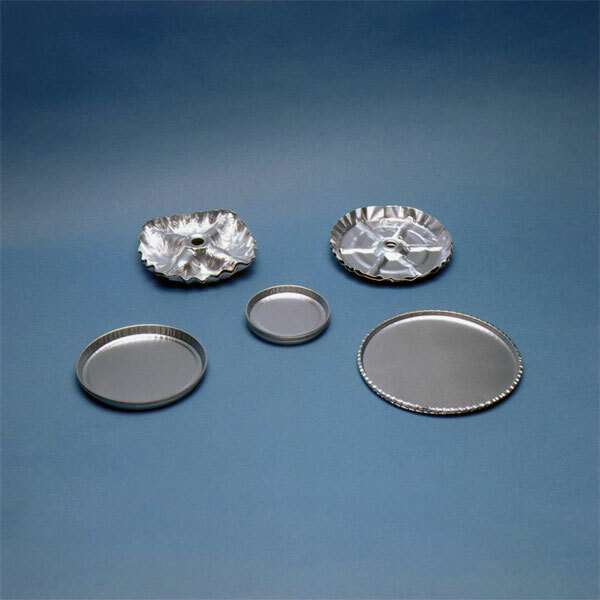 Evaporating dish, weighing dish, parts container, dust cover and more. No oil residue, no vinyl coating to create contamination problems for the user. Crimped sides for rigidity, sturdy gauge for heavy duty use. 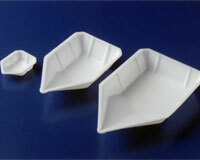 Large tab for sample numbers, flat bottom to improve sample handling, sides are angled for easy seperation. Smooth-sided, flat bottom, multipurpose "utility" dish. 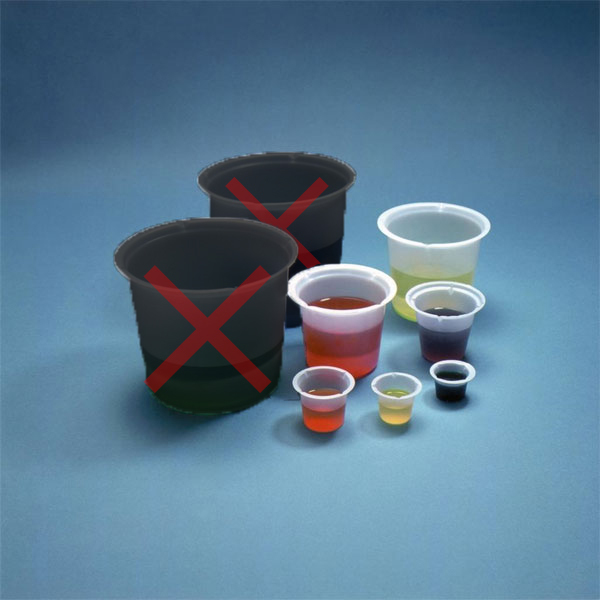 Oil-free and non-coated, no tab, ideal for storage, dispensing, general purpose sampling and testing. 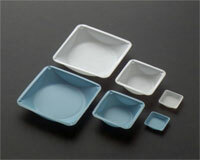 Dish contour facilitates stacking and dispensing. 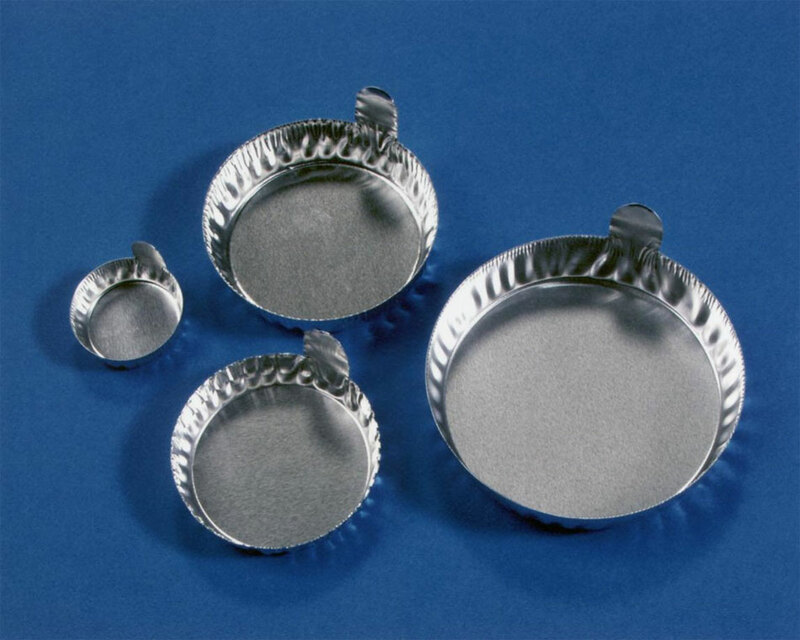 Weighing Pan, oil-free, ideal for general purpose weighing and dispensing. Compatible with both open and enclosed balances with smaller heads (70-95mm), weighs approximately 1.2 grams. 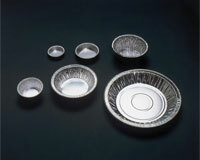 Weighing/Drying Pan, oil-free, ideal for general purpose weighing, dispensing, storage and drying. 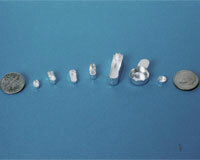 Compatible with Mettler, Sartorius, AND, Denver Inst., etc. Excellent weighing accessory. Flat-Top Balance Pan. Compatible with O'haus Balances and Moisture Analyzers or any Flat-Top balance. 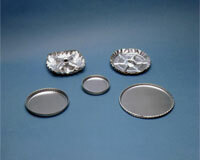 Drying Pan for solids (compatible with Cenco Moisture Analyzer). 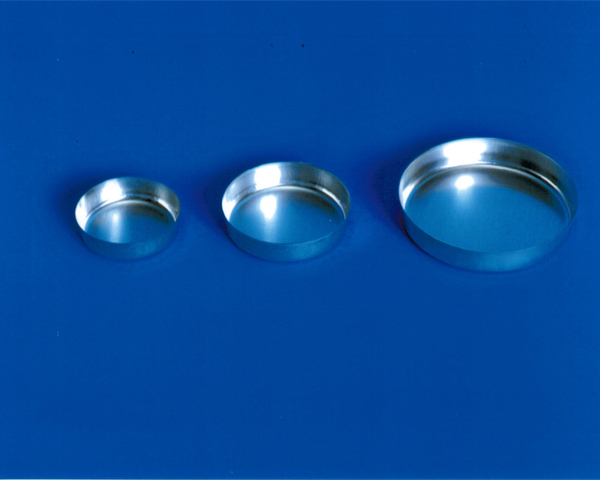 Drying Pan for liquids (compatible with Cenco Moisture Analyzer). 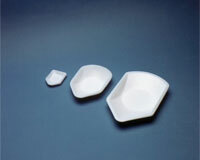 Unique design has a wide, flat bottom to resist tipping. Polystyrene (plastic); biologically inert; resistant to most dilute acids, aqueous solutions, and alcohol bases. Flexible design for measured pouring and dispensing. Disposable. 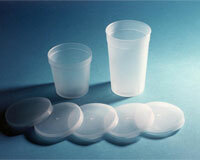 Translucent, anti-static, polystyrene (plastic); flexes easily for weighing, dispensing, or pouring liquids or solids. 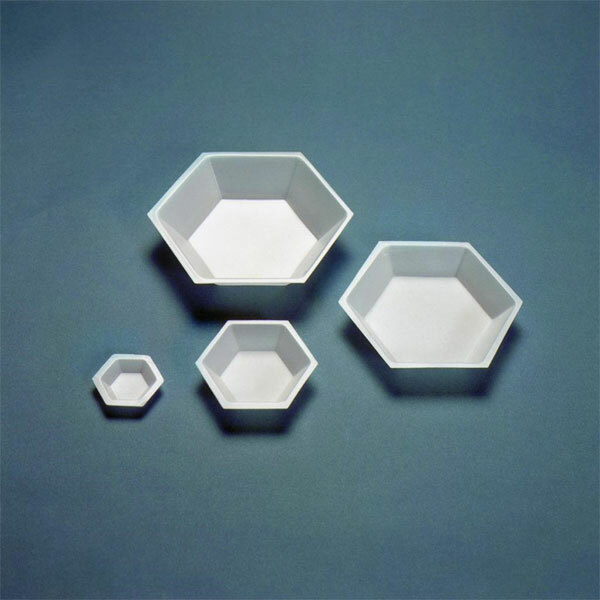 Unique hexagonal design for non-slip handling and pouring. Biologically inert; resistant to most dilute acids, aqueous solutions, and alcohol bases. Flat bottoms resist tipping. Hundreds of sampling and weighing applications. Disposable. 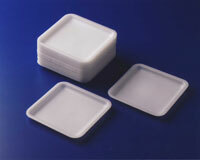 Design polystyrene (plastic) weigh dish facilitates pouring and dispensing. 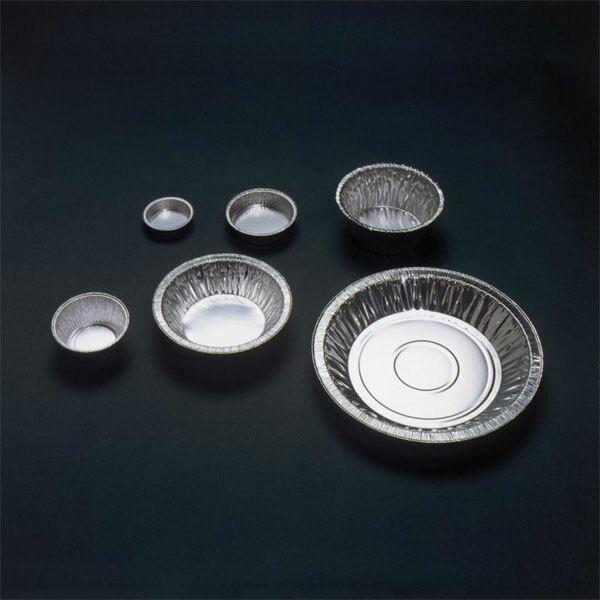 No need to flex dish to dispense liquids or solids; 20-30% thicker material for strength, stability, handling ease and safety. 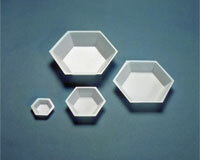 Weigh dishes have a flat bottom and will withstand 200 F. They are disposable, smooth, uniform and inexpensive. 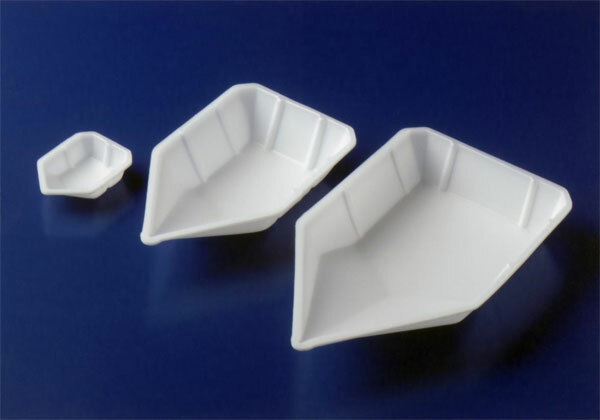 Available in three convenient sizes for any sample handling application. Disposable. PB-316 Small 2-¼"l x 1-¾"w x 5/16"d, 20ml Cap. 250/Pk, 2000/Cs. 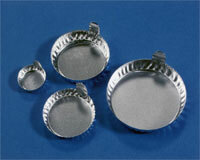 PB-315 Medium 5-3/8"l x 3-½"w x 1"d, 140ml Cap. 250/Cs. 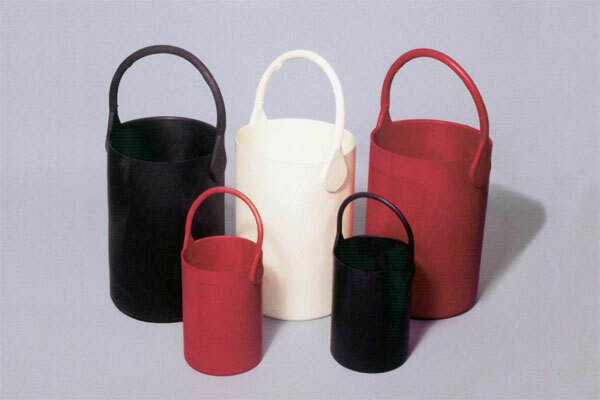 PB-317 Large 7-½"l x 4-¾"w x 1"d, 270ml Cap. 250/Cs. 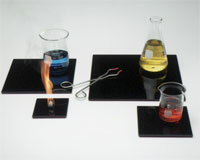 Protects expensive countertops from high temperatures associated with crucibles, glassware, or other labware. Each "thermoplate" has corner feet to prevent direct heat contact with countertops. Easy-to-clean, stain-resistant surface. Stable over a wide temperature range, -392 to 1200 F, near zero thermal expansion, and insensitive to thermal shock. Manufactured from a highly engineered glass ceramic. Four convenient sizes for every heat sensitive application. 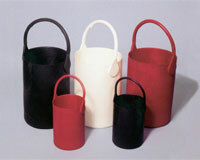 Small carrier accommodates 500 ml and 1000 ml (1 liter) bottles. Resists most aqueous solutions, acids, bases. Made from unique, high performance, thermoplastic elastomer. Excellent tensile strength. Can be used from -45 C to +110 C. Steam sterilizable. Resists oxidation in prolonged atmospheric exposure. Handle molded as part of carrier. Recessed marking area at top outer side of carrier. Carries liquids and ice without sweating. Resists bacteria and fungi growth. 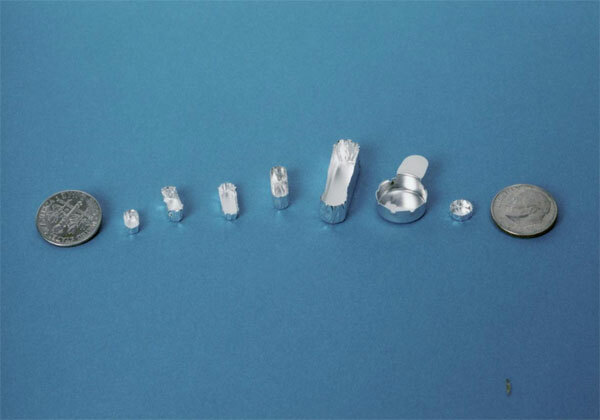 Precision-molded to assure uniform appearance and quality. Centering ring in base holds bottle to assure clearance from wall. 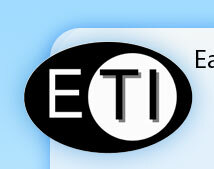 Home > Contact Eagle Thermoplastics Inc.